Villa Su Faru 1 lies directly on the sandy beach and the view from the terrace of the upper floor is simply stunning - fine white sand beneath you and in front of you the deep blue sea with the silhouette of the tower of Nora. The two-storey villa sleeps 8 people. It has 2 separate units that are connected via an external staircase. The units are not rented separately. Both floors boost one double room and one room with two single beds. Air conditioners provide pleasant temperatures, on the top floor one is placed in the corridor outside the two bedrooms and on the lower floor the conditioning unit is placed in the double bedroom. All rooms are equipped with mosquito nets. The kitchen on the upper floor has a gas stove, oven and a dishwasher. Through a hatch you can pass your meals to the round dining table overlooking the bay. In the off-season, you can spend the evenings on the sofa corner around a crackling fire. 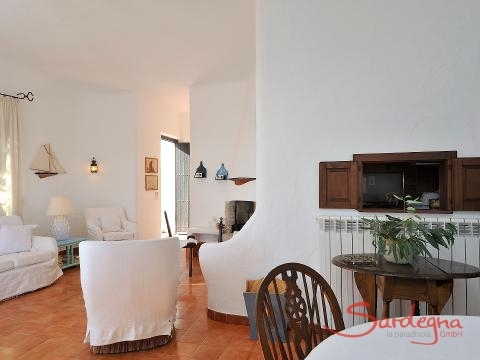 The highlight of the upper floor is the terrace overlooking the sea, equipped with wooden furniture and a sun roof. The lower floor boosts an "outdoor living room" with seating and dining under the pergola on the garden side of the house. Thanks to the outdoor kitchen with gas stove, small refrigerator and sink, you can also make wonderful meals and spend warm summer evenings in full privacy amidst fragrant pines. On the ground floor you will also find the washing machine and an outdoor shower to cool off. Private Property directly on the Sandy Bay of NoraThe property of Su Faru is utterly unique: 15,000 square metres private land directly on the sandy beach of the beautiful Gulf of Nora. Only six houses lie scattered within the property that is covered by a small pine wood, fig trees and Sardinian maquis. Access to the property is exclusively for guests of Su Faru, as an outer wall protects the estate and ensures quiet holidays in a privileged position. 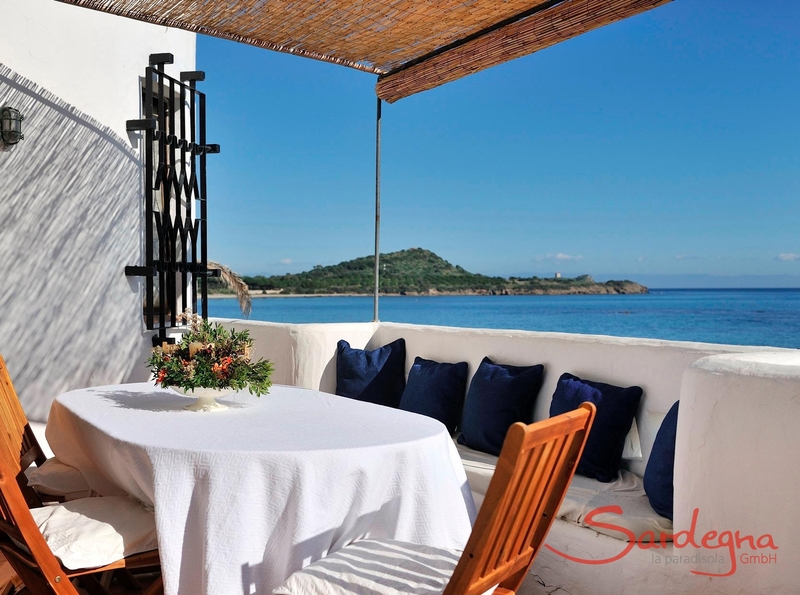 The sea-side gate of the residence opens directly onto the soft white sand of the beach: in front the sparkling sea and to the right the old Spanish tower on the top of the promontory of Nora, landmark of the area and namesake of the property - "Su Faru "which means" lighthouse " in the Sardinian dialect.Villa Su Faru 1 – in front of your eyes a spectacular sea view, at your feet the beautiful beachVilla Su Faru 1 lies directly on the sandy beach and the view from the terrace of the upper floor is simply stunning - fine white sand beneath you and in front of you the deep blue sea with the silhouette of the tower of Nora. The two-storey villa sleeps 8 people. It has 2 separate units that are connected via an external staircase. The units are not rented separately. 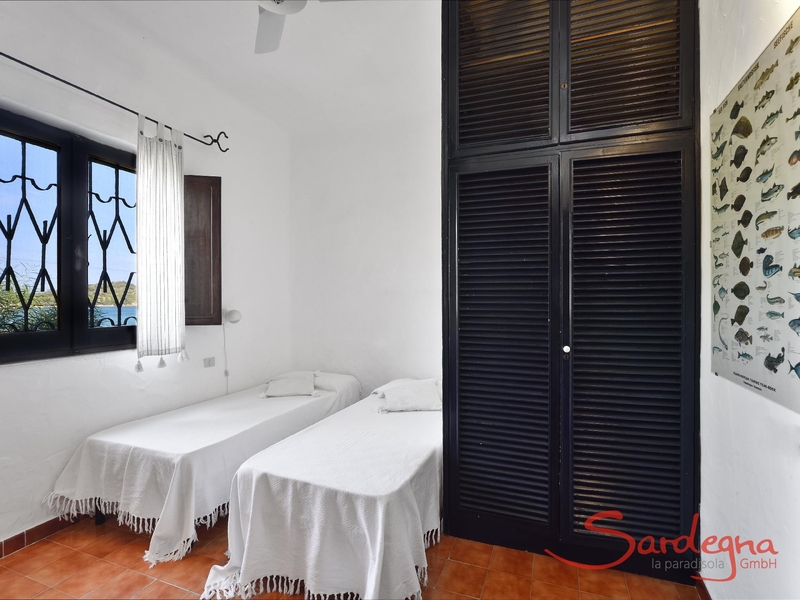 Both floors boost one double room and one room with two single beds. Air conditioners provide pleasant temperatures, on the top floor one is placed in the corridor outside the two bedrooms and on the lower floor the conditioning unit is placed in the double bedroom. All rooms are equipped with mosquito nets. The kitchen on the upper floor has a gas stove, oven and a dishwasher. 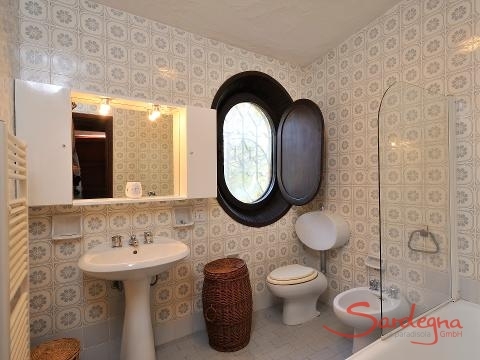 Through a hatch you can pass your meals to the round dining table overlooking the bay. In the off-season, you can spend the evenings on the sofa corner around a crackling fire. The highlight of the upper floor is the terrace overlooking the sea, equipped with wooden furniture and a sun roof.The lower floor boosts an "outdoor living room" with seating and dining under the pergola on the garden side of the house. Thanks to the outdoor kitchen with gas stove, small refrigerator and sink, you can also make wonderful meals and spend warm summer evenings in full privacy amidst fragrant pines. 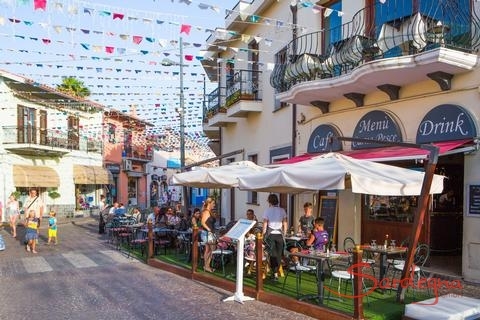 On the ground floor you will also find the washing machine and an outdoor shower to cool off.Close byRestaurants of all kinds are accessible from Su Faru by foot. 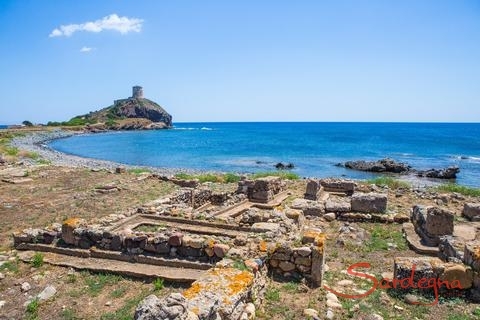 You can choose between pizzeria, fine dining and gourmet restaurant.The Roman and Phoenician archaeological site of Nora on the tip of the headland is one of the biggest attractions in Sardinia, it distances only a 900 meters from the property. A bike path connects the excavation site with the nearby town of Pula and runs right past the estate of Su Faru. In just a few minutes you can cycle from the impressive ancient ruins directly into the heart of a colourful, typical Sardinian town with first class bars, cafes and restaurants. During the summer months the bustling streets around the main square are ideal for an evening stroll and shopping. 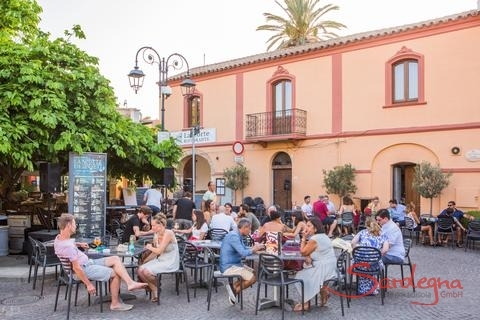 If you like it quiet, you will be attracted by the secluded Sulcis mountains in the hinterland: a natural paradise, ideal for hiking and mountain biking. Beach lovers will find what they are looking for everywhere along the coast. A special highlight are the beaches of Chia, about 20 minutes south. With its turquoise waters, white sand and the juniper-covered dunes they are among the most beautiful beaches of Sardinia.